1. Preheat the oven to 200°C, gas mark 6. Melt the butter in a frying pan, add all the ingredients except the breadcrumbs and fry for 2–3 minutes. 2. Cool slightly then mix into the breadcrumbs with 3 tbsp water. Roll into 16 balls and place on a greased baking tray. 3. Bake in the preheated oven for 15–20 minutes until golden. 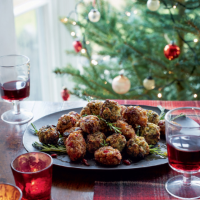 Make the stuffing balls to the end of step 2, cover and chill for up to 2 days. To freeze: make to the end of step 2, cover and freeze on the tray. Transfer the balls to a freezer bag and freeze for up to 2 weeks. Defrost thoroughly, then cook on a greased tray as above.